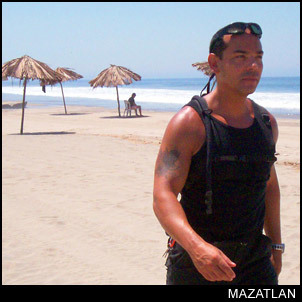 Stone Island Tour : Mazatlan's most famous tour. Spend the day at the finest beach club on Stone Island, for the best price in town. Perfect for a cruise shore excursion or day in paradise. There are two embarcaderos that offer boat service to Stone Island Mazatlan. One is located on the eastern side of the peninsula of Mazatlan near the end of 21 de marzo Street and drops you off a little more west on Stone Island. This embarcadero operates 24 hours a day. The other is located on South Beach on the south-eastern tip of Mazatlan and operates from about 7 a.m. to 7 p.m. You will disembark a little more east on Stone Island. We recommend this one, as a walk straight ahead upon reaching shore will lead you to an array of palapa restaurants and many choices for fun in the sun (or shade). If you wish to reach Stone Island from South Beach, the air-conditioned Sabalo Centro bus goes right there for 8 pesos, and bus drivers do give change. If you accidentally get off at the larger La Paz Ferry Building, don't worry. Just walk back another block east and go to the small yellow building on the waterfront. There you will find a water taxi for 15 pesos, round trip. Their last trip back from Stone Island is 5 p.m. Be sure to hold onto your ticket, as it will be collected upon your return to mainland Mazatlan. See above for our recommended disembarking location. Behind the middle of the strip of restaurants along the beach you will find a concrete road. Follow this northward for a look at real Mexico. Small stores are set in among houses, and people ride by you on horses as roosters crow. Follow this road for a view of the Pacifico Brewery across the channel or to take a rest at the Plazuela en Memoriade de J. Jesus Moreno. Just off this small park is a carnival, complete with ferris wheel and games that starts every day at 7 p.m.
RV Park : No owners were there when we stopped by this seaside RV Park, but from what we could tell, there are 17 units, water hook-ups, electricty hook-ups (110/220), and sewage hook-ups. Phone: 914-1444. Restaurant Elvira : Restaurant Elvira at the beginning of Stone Island beach offers on-site camping after the resaturant closes. Cabanas, with two beds, go for about $10 USD per night or you can just hang a hammock for much less. Seafood is the usual fare for the evening meal. Chabela Camping : For those travelers who are more used to the laid back hostel experience, Camping Chabela is for you. Trinidad and Chabela have a beautiful layout just yards from the beach. A cabana with a loft is about $10 USD per night and includes access to the shared kitchen, showers, and bathrooms. You can set up a tent or hang your hammock for about $3.50 per night. Rentals of more private rooms are avilable, even by the month. Chabela Camping is a unique place that relies on the coconut for many uses, including using its shell for crafts (which you can help make in a work-share program). To get there, walk east along the the southern beach and turn left towards the end of the row of restaurants, just before the Restaurant Union de Ejidatorios. Carmelitas' : Stone Island has many great restaurants, but one stands out in particular . . . Carmelitas'. Carmelitas' Restaurant is very clean and fresh fish is caught daily. They have excellent hamburgers and ceviche (must try). We have had many good times eating and talking with friends as we enjoy the beach and Carmelitas' Great service . They have hammocks as well as lounge chairs and I can communicate in English if need be. This is the locals choice. Great service, good vibes, nice people, and wonderful food. Lety's : Lety is the sweet matriatch of this family-run palapa restaurant located right on the beach on Stone Island. She is from Stone Island, and in fact lives in the house where she was born. Hers is the only restaurant that serves home-made tortillas on all of Stone Island, and her ingredients are always fresh. Chicken, fish, soup, quesadillas, or combination plates can all be yours from 45 to 85 pesos (about $4.50- 8.50 USD). After your meal, enjoy her home-made limeade, relax in a hammock, play some volleyball, or even take a shower. Her restrooms are clean and always stocked with toilet paper and even include changing rooms, which makes this the ideal place to recoup while out of the sun. A local favorite, you must try Ley's! Restaurant Cardon : This restaurant with full bar also offers banana boat rentals ($5), horseback rides, ATVs ($25/ 30 min. or $35/ hour) and stalls selling jewelry and clothes. Estrella del Mar : This restaurant is always rocking with its jukebox and casual atmosphere. A variety of coconut treats are offered along with seafood, seafood, and more seafood! Meals range in price and size. Expect to pay just $6-7 for a single meal or up to $30 for the ultimate seafood platter that feeds up to five. Open 7 days a week, 9 a.m. to 6 p.m.
***If Mariachis find their way to your table at any of these restaurants, the going rate these days is 3 songs for $10.